Question ....Hello, What is an easy way to test out an auto darkening helmet? I bought one at Harbor Freight and looked at the sun and it did not darken. Since we value our eyes, this is really important.Thanks. At Welding expos, the sales people like to demonstrate auto darkening helmets using a torch striker like you would use to light an oxy-acetylene torch. It seems like safest way to test one without subjecting your eyes to welding flash. Once you determine it is darkening, It's a good idea to check for consistency of shade around the outside edges of the lens. "An auto-darkening helmet contains an electronic shutter module. This module contains fixed/static IR (Infra-Red) and UV (Ultraviolet) filters that require no electricity to operate along with an electrically operated LC (Liquid Crystal) light valve or shutter. The LC valve/shutter darkens/lightens when a voltage is applied that re-orients the crystals that are floating in a liquid which is separated by two sheets of glass. The shutter module also contains photocells (light-dependent resistors) or other photosensor that is wired into an electronic control module. The control module detects the bright light emitted by the welding arc and closes (darkens) the LC valve/shutter. A timer circuit lightens the screen again some time (perhaps 100milliseconds) after the arc goes out and ambient light levels return to normal. Modern auto-darkening welding helmets have adjustments for sensitivity, shade (darkness achieved when arc triggers helmet), and time delay after arc removal before helmet returns to the normal, non-darkened state. The sensitivity adjustment controls how readily the helmet darkens when exposed to a bright light source. If the sensitivity adjustment is set too low, the helmet may not darken when exposed to the arc, especially if the arc is small. On the other hand, if the sensitivity is set too high, the helmet may stay darkened when exposed to sunlight, bright room lights, arc flashes from other welders some distance away, etc. 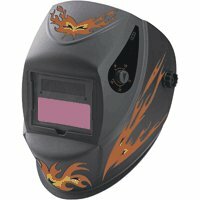 Some auto-darkening welding helmets, especially higher priced ones, allow the user to adjust the "shade" value. One popular helmet allows adjustment between shade 9 and 13. Shade 9 is adequate for small, low intensity arcs, while 13 is used for bright, high energy arcs in dark spaces. The helmet user should initially set the helmet for an intermediate value and adjust the shade value up or down as required to get the best view of the work while welding and above-all to avoid excessive brightness that dazzles or irritates the eyes."